We value the human touch, every step of the way, from our global network of growers/producers to our valued customers in Japan. At Greenwings, our motto remains “Creating blooming connection”. What better way to start than by listening carefully to both you and our dedicated floral experts in 9 countries, on 5 continents. Since 1997, Greenwings has been importing and distributing cut flowers, perfecting the process and widening the choices, so what the consumer desires is matched by the diversity of the flowers we bring into Japan. Product, price and reliability of service are paramount with every order, and our supply chain spanning the globe is rooted in trust, cooperation and the highest standards of quality control. At the heart of any decision we make is you, our customer – and, as importantly, your clientele. Simply put, we recognize that your success furthers our business, and is the engine that transforms us into a better company. Whether you care mostly about price, value above all else customer service, seek answers to your flowers’ origins or counsel on how best to present your floral gift, we address your particular preferences. Every step of the way – from field to your doorstep – Greenwings applies the latest technologies to ensure freshness and expediency, including onboard the aircraft and at our dedicated Narita logistics center. We invite you to explore our website, and enter the special sections for our members covering the industry and other topics of interest. At Greenwings, we care about people, network and flowers. 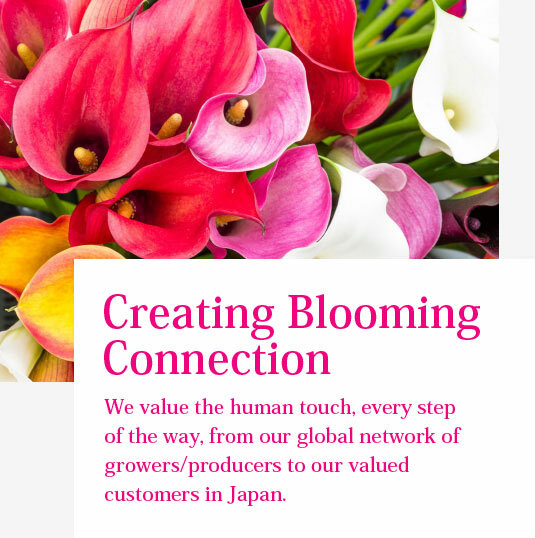 We value the human touch, every step of the way, from our global network of growers/producers to our valued customers in Japan.